Metamorphose is an ongoing conversation in clay about the journey of becoming a mother and being a mother. It takes place in this study of a common utilitarian household item, the mug. 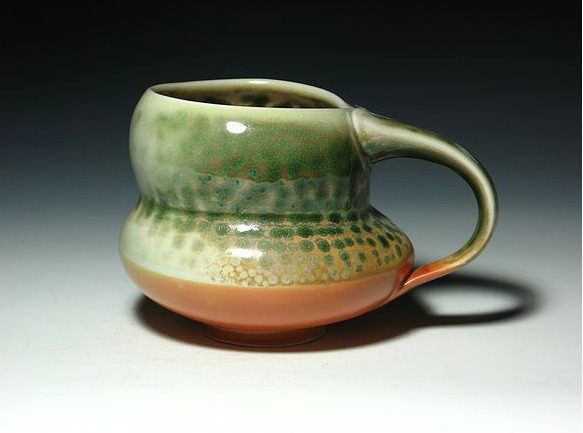 These mug forms are endowed with the presence of both vulnerability and strength. They celebrate the glorified transformation of the pregnant body, but they bring visibility and conversation to the continuing transformation of the body and person after birth. That they are mugs points to the commonness of everyday lived experiences by wo/men in motherhood and motherwork. Each mug is entirely different reflecting the fact that the experience of mothering is unique to each individual person, even though motherwork is quite often mistaken as a universal concept. These kinds of assumptions about the universality of mothering actually makes the personal experiences of each person doing it invisible. Metamorphose is meant to resist that kind of assumption. The mugs are a reflection of the pregnant body, the very beginning of the anatomical journey of the female body as it enters motherhood but the mugs also celebrate and acknowledge the transformation of the female body after pregnancy, post birth, which in our society, is a less celebrated transformation, and a less visible journey. Post birth bodies deserve the patience, celebration and glorification that childbearing bodies receive. Post-birth bodies are spacious, healing and rehabilitating, while still maintaining a new additional life. The mugs acknowledge, give presence, and beautify the body post birth. These mug forms acknowledge the more subtle but continual anatomical journey our bodies endure during motherwork and also a person’s transformative and altering personal journey throughout motherwork. Pertaining to motherwork this conversation in clay is not exclusive to birth mothers, but opens up this conversation to all caregivers that take on motherwork. A man, or a non-biological parent may not physically go through the birthing journey but that person can experience the altering and changing of their own bodies and spirits throughout the journey of motherwork. The common daily motions endured during motherwork, and the effects and marks that motherwork experiences leave on our bodies are also portrayed here in these mugs. With the unknown journey and struggles that each child brings, caregivers are altered in person as they journey with that child through the highs and lows of each experience. This altering of person throughout the lifelong journey of motherhood, so private and personal, joyful and painful, messy and beautiful is celebrated and acknowledged in these basic everyday utilitarian objects. Like motherwork, the mugs are individual, unique and beautifully imperfect. The forms are altered, and asymmetrical, with undulating rims and drippy glazes. I choose to alter the form as a way to represent and interpret how we are altered in person and body in motherwork. 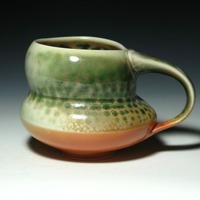 The mugs are fired in a salt and soda kiln resulting in much surface variation among the cups. Each of these mugs are a functional sculpture and an experience, inviting the viewer to apply their own experiences in motherhood and motherwork to the conversation. The vulnerable yet commanding forms salute the invisible labor of caregiving and everyday experiences of motherwork, which involves a metamorphosis of person and body. Metamorphose is an artistic attempt to make the invisibility of motherhood and motherwork visible in households and workspaces via an everyday utilitarian object. “Beth Goobic,” Artist Parent Index , accessed April 22, 2019, http://www.artistparentindex.com/items/show/28.